Even for educators who are excited about using games in the classroom, questions inevitably come up around the very real obstacles to implementation, and strategies for overcoming them. A recent survey from the Games and Learning Publishing Council asked 700 teachers to identify and rank the major barriers to using games in the classroom. Here are the top 10 obstacles they list and ideas about how to overcome each one. Forty-five percent of teachers surveyed reported that insufficient time is a barrier to implementing game-based teaching strategies. But this concern presumes that video games would take time away from instruction. It’s a matter of changing tactics and presumptions: games can be integrated into everyday curricula because they enable teachers to present academic concepts in a contextualized, experiential way. Imagine games like activities or projects that can either reinforce or introduce new concepts. Forty-four percent of teachers surveyed reported that cost is prohibitive. It’s all too true that teachers lack the financial resources they need and often use their own money to purchase supplies. There's not much that can be done to ameliorate this obstacle, though for motivated teachers, resources like Donors Choose and other crowd-sourced fundraising sites can certainly provide some options. The majority of tablet games are fairly cheap, ranging from $1 to $10. Many are also free, such as Questimate!, a game that introduces students to estimation skills. The cost of using any kind of new tool in school can be prohibitive, but for educators who want to make it happen, trying free games is a great first step. Thirty-five percent of teachers surveyed reported that they lack the technology resources to introduce game-based teaching strategies. This obstacle might have more to do with perception than reality. Though some tech corporations may push the notion that one-to-one device-to-student ratio is necessary, that's not necessarily the case. 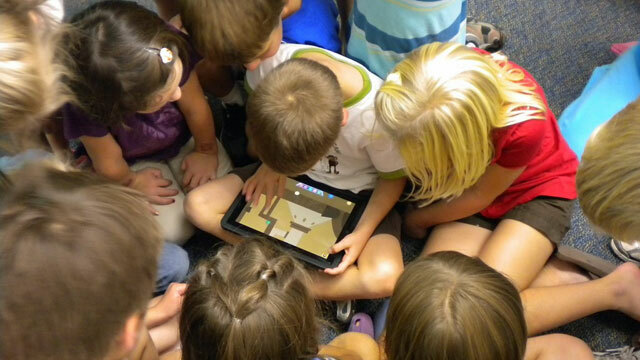 Teachers can go a long way with learning games using just a few devices. Students can play the game in groups, collaborating and working together. Follow it up with a group writing project to describe how the game impacted their thinking about the subject matter. Have one group play the game while the others do non-digital activities. Rotate your students from one project to another. Thirty-four percent of teachers surveyed reported that it’s hard to find games that fit the current curriculum. Check out Graphite, Playful Learning, and Educade for ideas. All three of these sites allow you to filter information about games by traditional subject areas and by grade level. Remember that the best way to use games is as a supplemental reinforcement for your traditional teaching. Don’t look for games that will teach your curriculum. Instead, look for games that might approach the same subject area from a different perspective. Twenty-nine percent of teachers surveyed reported that an emphasis on standardized tests makes using learning games difficult. Game-design companies have been addressing this by attempting to align games with standards. Filament Games, for example, offers many learning games and each one includes a "standards map." Check out their PLEX Life Science suite of games and how they map to various sets of science standards. These are fun, playful games that don’t "teach to the test," but do align directly with state standards. Twenty-seven percent of teachers surveyed reported that they don’t know where to find quality games. The big app stores don’t help much either; they want to sell games and apps more than they want to help students. See the sites listed above (number 4). All three of these sites offer sophisticated ways to filter search results and find specific games. Also, read How To Choose A Learning Game for more ideas. Twenty-three percent of teachers surveyed reported that they're not sure how to integrate games into instruction -- thus the need for this guide! You'll find ways to implement game-based learning, and understand the theoretical, pedagogical, and practical uses. In this guide, we show how to apply games to math and humanities education, as well as how games can facilitate interdisciplinary learning. Seventeen percent of teachers surveyed reported that they’re unfamiliar with technology. That’s okay. Most of the writing about game-based learning focuses on digital media, but the truth is that you don’t necessarily need devices. At the Quest To Learn School in New York City, game design is a way of thinking, a paradigm. A great deal of their curriculum uses paper-based games rather than digital games. Check out their print and play games. There's also the great Socratic Smackdown, which is makes it easier to add games to your classroom without technology. Fourteen percent of teachers surveyed reported that lack of administrative support when it comes to games in the classroom. But with more and more data to support the use of games, teachers can use the new research to convince administrators. For example, an SRI research showed that students on the median score 12 percent better on standardized tests. This kind of research can help you make a strong case for using games for learning with your administrator. Nine percent of teachers surveyed reported a lack of parental support for games in the classroom. That's clearly not the majority of parents' perspectives as evidenced by the small percentage; what’s more, a Cooney Center report, Learning at Home: Families’ Educational Media Use in America, showed that more than half (57 percent) of parents say their children have learned "a lot" from educational media. Still, teachers may have to account for their use of games for learning, and in those cases, start slowly. Demonstrate to parents (as you may have done with administrators) why you're using these tactics with evidence to back it up, and you'll prove over time how well it's working.